Fits perfectly on our bed with the deep mattress. I can finally make up my bed neatly. Just the right weight of fabric for us. The Palisades bedspread set features flourishes of tropical fern branches and lotus blossoms set in a soft frame of blue and green. Reverses to coordinating solid color for enhanced visual impact. Prewashed and preshrunk. 100-percent soft microfiber polyester face; 100-percent Cotton back; 60-percent Cotton, 40-percent polyester fill. Machine wash. Set includes: Bedspread and two pillow shams (one sham per twin set). This absolutely has to be my most favorite quilt purchase on line. It truly is a oversized king quilt. I believe it measured at 120" x 118". It hangs over both sides of the bed to about 2 inches from the floor. (We have a sleigh bedframe.) The shams fit nicely on king size pillows. The only con is that it is light weight so it would not be to warm in the winter if you keep your bedroom really cool. I have already ordered a down comforter to go under this quilt. Color and pattern was not what I was looking for--very old fashioned. The title of pastel was misleading. This has dark pinks and almost reds. Returned. All other factors were great: size, weight, feel. This bedding set is well made and very soft. I had not ordered this brand before, so I wasn't sure if I would like the microfiber. I found that I like it as well as my cotton quilts and there is less chance of it shrinking. I highly recommend ! The colors in the bedspread are varied and pretty. It fits perfectly with the decor already in my guest bedroom at our summer home. I needed the extra width and length to cover adequately. I washed the set before I put it on the bed and it laundered without any problems. I like to dry my linens on a clothes line and it held up well to that as well. I couldn't be happier with my purchase! So pretty in our Master Bedroom! Two of our bedroom walls are dark gray, and the other two are white. This beautiful bedspread just wakes up the room, and shows off the boho-chic pewter headboard/footboard. The room has evolved into a ‘shabby chic’ delight for us. Added two dark blue nightstands, and a glass-chrome vanity to make the dark wood armoires shine. We love this room, and it all started with this gorgeous bedspread. Lighter weight than a quilt, comfy in winter with one blanket underneath, the shams are a nice touch. I love the stitching quality, and the subtle grays and greens in this bedspread. Haven’t washed it yet, but it looks like the stitching and colors will hold up well on gentle cycle. But it’s likely too big for our washer and will need to go to the dry cleaners or a very large washer. So far, we like it. •••UPDATE••• This comforter is just too large even for our king-size bed. We got a fluffy white chenille comforter to replace it, but we still kept this huge quilty bedspread for family movie night, extra guests, etc. It’s pretty. Warm, and well made, just not the right fit or match for our bedroom. Finally I found a quilted bedspread that fits perfectly on my king size bed and goes to the floor. The color is even better in person and looks lovely with my pale blue walls and accessories. Well worth the price !! The overstock.com website description made me think they had both a King and California King size of this bedspread. It wasn’t until I received my bedspread that I realized they consider those two the same size. I ordered this thinking I would be getting a California King size bedspread. King and California King are two different sizes and they do not need to be lumped together as one. A light-weight quilt, perfect for warmer weather. The top colors weren't quite as vibrant as I'd expected and the blue was brighter than expected. However, it hides wet muddy cat tracks very well and that's what I needed. It's very soft and washes well, dryer time being short. 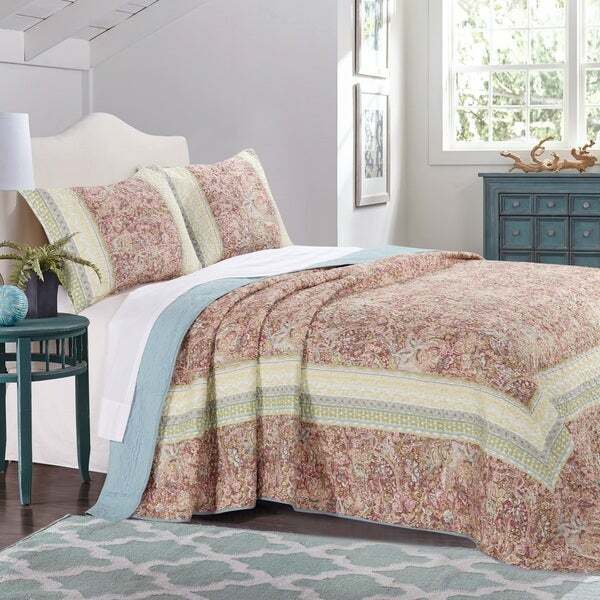 I love this bedspread, its soft colors and design create a peaceful setting in my bedroom. I love my new bedding set. Very light weight and soft. Colors are true to pictures. I really like this quilt and pillow shams. The colors are great. It is a pit more on the pink side. When I saw it in the picture I thought it would have a little orange in it. Good quality. Really nice! A true bedspread quilt! It is oversized for a standard queen mattress, but it leaves room to shrink and for today’s thicker mattresses with toppers, etc. it should fit even better! Great buy! This is a lovely set! Great for warmer climates, because it is very lightweight. In my colder climate it did not work for me. The colors are beautiful and the quality seems nice. This bedspread is beautiful and the perfect size and weight. I am thrilled with it. This is a true ‘bedspread’. I’m only giving it 3 stars because I was thinking it would be more like a quilt from the description and that the colors are not as pronounced as in the photos. It’s still a nice bedspread. And I kept it...for the camper. It’s very well made. "Someone mentioned muddy cat tracks. We have 2 cats that are in and out. Will the microfiber material hold up to cats that jump into the bed and sometimes have to use their claws? I don’t want a spread that will tear or snag. " I believe with any fabric, it will rip or snag if its clawed. It is pretty soft fabric. "Where do I find extra shams and coordinating accent pillows pictured?" Unfortunately additional shams are not available. "Will you be getting more king sized bedspreads any time soon?" We will be receiving more at the end of May. I hope it helps. "width size & length size"
Look under Details and Specifications for measurements of the quilt. Listed are all the different bed sizes. "CAN SOMEONE SHARE A PICTURE? I FIND THAT WEBSITE PICTURES ARE MISLEADING SOMETIMES. MY WALL ARE PAINTED SAGE AND I'M TRYING TO TELL IF THIS WILL MATCH." My walls are also green, just lighter than your sage. While there is not a lot of green in the bedspread it will 'go' with many wall colors. There is a touch of green mixed in with the pink area but these colors are soft and muted, and the pattern is small. The border has a touch of this green, as well as a row of lemony green. The blue lining is more dynamic than I thought it would be. There is no reason this won't work with your wall color as you generally don't want colors to be too match-match. This is a light weight quilt. "If I find that I don't like this for any reason is the return free?" Love the variations of colors. I wanted a lightweight bedspread without the fuss of a bedskirt. Living in Texas I don't need something too heavy.